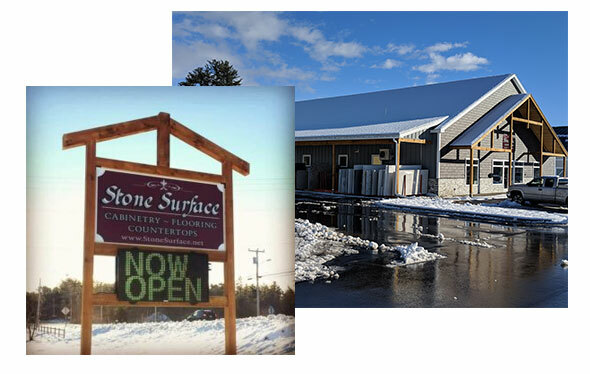 Naples, Maine is our fabrication & primary inventory site. Portland, Maine is our Southern Maine showroom. Hi Greg, Ron and I just wanted to thank you and Audrey for all your help with redoing our kitchen. We absolutely love the kitchen now! Please thank your team for the wonderful job they did. I wanted to tell you how much I love the countertops - they are gorgeous! The guys were awesome - so professional but very friendly and funny…..thank you again for everything! Just wanted to say thank you too you and Stone Surface for our new counter tops. They look amazing with the new sink and faucet. Erin and I are very happy and appreciative. Thank you! The counter tops look FANTASTIC!! Your whole team was great to work with and made the whole process easy. Just wanted to extend a huge Thanks....The crew was outstanding yesterday and everything looks phenomenal. Please extend my gratitude towards the rest of the team/crew. Well done. The professionalism, workmanship and attitude for “making it work” is refreshing to see. You should be proud to know that you have a great representation of your company out there. We are very satisfied with the workmanship and finished product. ...and I have to say that we are THRILLED with everything. The stone, the sink, and most of all your people. From Rob who did our template who was exceptionally helpful to the installers who were equally polite, helpful and professional. I really want you all to know how much I appreciate your help and excellent work. I am thrilled with my counter tops. You were all extremely friendly and helpful. Audrey your color choices were perfect they match the counter top perfect. Thank you for a great job.